This monster appears in the artwork of Silent Burning. 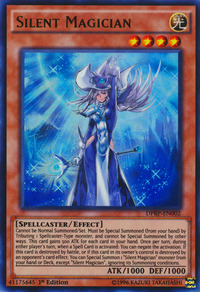 This card's effect whereby it gains ATK based on cards being added to a player's hand is a reference to the animé effect of Silent Magician LV0. This card is the last monster in the original Yu-Gi-Oh! series to declare an attack. This card is the Spellcaster counterpart to Silent Swordsman. They both have the same Attribute, Level, ATK, and DEF. They both cannot be Normal Summoned or Set, instead only being able to be Special Summoned from the hand by tributing 1 monster of the same Type. They both gain 500 ATK after a player draws/adds a card to their hand. They both have an effect that can negate a Spell Card's activation once per turn. They both can Special Summon a monster in the same archetype as themselves upon being destroyed, ignoring Summoning conditions it might have. Oddly though, this card would have to be Level 9 to have the same ATK as Silent Magician LV8, and the LV in the name would be 5. This card symbolizes Yugi's reliance on Atem as well as Yugi's growth that leads him to surpass Atem since this card gets stronger as the opponent gets stronger, id est, as the opponent accumulates more cards in his/her hand. This was also the card that Yugi used to defeat Atem, showing that Yugi did indeed surpass Atem. This interpretation is further supported by the way Silent Magician initially starts out far weaker than Dark Magician, but by the time it reaches level 8, it has far more attack points than Dark Magician.